The 3rd Kalanirvana International Artist Residency (KIAR) begins in KIIT University campus. After the success of KIAR in past 3 years, Kalanirvana International Art Centre is bringing 3rd KIAR International Artists Residency from 9th to 21st December. This 12 days event is first of its kind in Odisha and first of its kind in India in a large scale. More than 45 artists from 25 different countries including USA, GERMANY, AUSTRIA, NEW ZEALAND, CYPRUS, MEXICO, ROMANIA, SOUTH KOREA, TURKEY, BELARUS, MOROCCO, LEBANON, TUNISIA, KWUAIT, EGYPT, IRAN, IRAQ, SAUDI ARABIA, TURKEY, and INDONESIA etc. are participating in this mega event. The motto of this event is to bring the world together through art and the artists from different countries, so that they can know about the art and culture of Odisha and India at large. 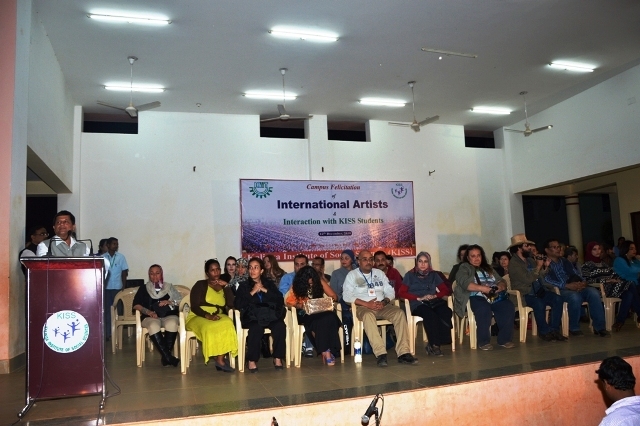 The artists interacted with students of KISS and enjoyed the cultural programme performed by students. On this occasion Dr. A. Samanta, Founder, KIIT & KISS felicitated the artists. Expressing his satisfaction over this mega event Dr. Samanta said, it will help to propagate the art and culture of Odisha as well as India. The artists coming from various countries will get a firsthand experience about Odisha’s art and culture. Among others Ashish Padhi, Director Kalanirvana, Smruti Ranjan Nayak, local co-ordinator and Dr. P. K. Routaray, CEO, KISS were also present. Kalanirvana is an art movement dedicated to bring the world together through art. It is a revolution which aims to build a bridge between artists of different thoughts. Kalanirvana started in 2010 and so far Kalanirvana is instrumental in the awareness, promotion of art and culture internationally and nationally. It has organised three International Artists residencies, eight International Art exhibitions (USA, TURKEY, EGYPT, INDIA), and more than 20 national exhibitions and more than 40 art and photography workshops in India and abroad. The network of Kalanirvana with more than 50,000 artists from 55 countries and 20,000 photographers and 300 film makers is the result of philosophy of connecting to different culture through art. As art does not have any boundary.